As the end of the year approaches, your friends at Friends of the Fountain and Walk want to offer our warmest holiday wishes – and a big thank-you for your ongoing support, which has made so much possible this year. First and foremost, our City’s beloved Fountain at The Circle got its first major upgrade since it was restored and rededicated nearly 20 years ago. Thanks in great part to your generosity, FOFW and City crews were able to replace the aging fountain works with a new high-efficiency pump and filter system. A new waterproof surface was applied to the lower fountain pool and the decorative tiles around the perimeter were restored. The fountain structure itself was cleaned, and its unique details – the bear cubs and other design features — were preserved by creating 3D digital models that can help fashion replacements if that’s ever necessary. All this work should ensure the Fountain – which recirculates water as drought restrictions dictate – will flow efficiently and remain intact for decades more. On Fountain Walk, where the concrete balustrades and steps were repaired last year, new plantings bloomed in formerly barren beds. Volunteers, City crews and generous neighbors along the walk put in numerous hours of labor to establish what should be a pleasing and drought-friendly enhancement of the historic century-old walkway. As many of you know, FOFW is a small, all-volunteer organization made up of neighbors and admirers of the Fountain and walk, Berkeley’s first public works of art. We rely on the involvement of everyone who cherishes these landmarks to help us help the City keep them thriving. Please take a moment to peruse our website, where you’ll learn about FOFW, its activities and history, and the ways in which you can help. One quick and easy way is to donate, to make sure FOFW has the funds necessary to take on future projects and unforeseen problems. Checks sent by mail are always welcomed at Friends of the Fountain and Walk, P.O. Box 7343, Berkeley, CA 94707. Or donate securely online through our website via PayPal. Your gift is entirely tax-deductible. Friends of the Fountain and Walk is a registered nonprofit 501(c)(3) organization. You can also volunteer – consider joining our board, come out to work parties held the first Saturday morning of every month, or contact us with other ideas about how you’d like to pitch in. Or do some holiday shopping in our online store; click the Merchandise link to purchase cards, photos, tote bags and more. 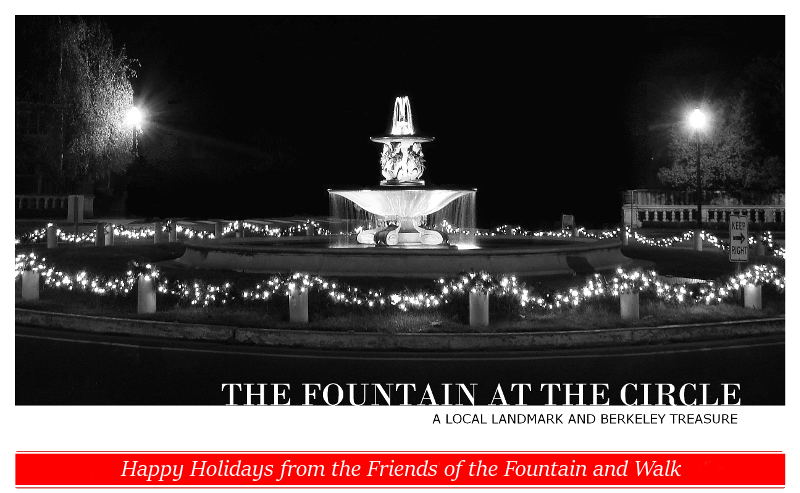 And as the holidays arrive, watch for another big thank-you to all the Berkeley community: the decorations that will light up the Fountain and The Circle soon after Thanksgiving.